This new trihalomethanes (THMs) removal system combines the latest mixing and air-stripping technologies to effectively remove all four types of regulated THMs. The new system helps municipalities comply with the 80-µg/L locational running annual average limit specified in the U.S. EPA Stage 2 Disinfectants and Disinfection Byproducts Rule. 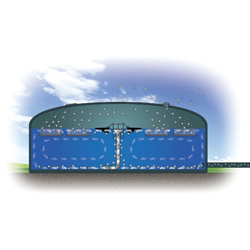 The system is modular and scalable to fit any tank size or THM concentration.